FAST-SWAP interlocking polycarbonate Fixture Plates and aluminum Docking Rails for VISION fixture systems. Open-Sight™ is the Inspection Arsenal® version that is especially designed for vision systems and it offers the same profit-enhancing benefits as Loc-N-Load™ for CMM systems. 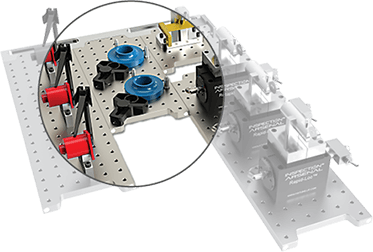 Docking rails fit the stage of any optical machine. Black anodized aluminum rails and scratch-resistant polycarbonate plates are 0.5” thick with 1/4-20 holes.